any of wewe got a strange message from someone named "lolmat"? and if so, this message looked like this? "You will die. I gonna kill you. Because you're Yoshi-Fan. That's not a joke." anyone got this message?? au I am the only one? Just report, seriously. I'd have no time to deal with messages like them. 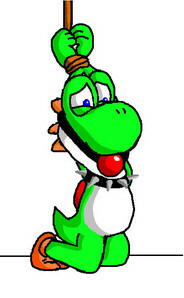 What's so wrong with being a Yoshi fan? To him, it must seem like a sin although IT ISN'T! There's worse things to be a shabiki about..
Don't worry too, you're not the only one. I responded, but just don't listen to him. Oddly, I didn't receive any message from that immature hater. And I'm one of the Yoshi fans. I'd figure he'd be gunning in on the dedicated mashabiki au die-hard mashabiki first but I got nothing at all.